Herbie Hancock’s 40-year career as a recording artist is graced by a series of astonishing musical landmarks. Few other musicians of the 20th century have exhibited the wide range of interests and mastery of various genres that this jazz legend has brought to his remarkable body of work. Nonetheless, Hancock still expresses the kinds of irrepressible curiosity and restless creativity that keep him pushing at the boundaries of modern music. 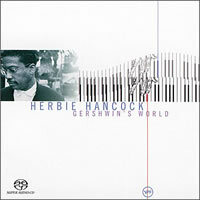 The wedding of that artistic vision to his extraordinary musical versatility put Hancock in perfect position to approach his new Verve recording, Gershwin’s World, a far-reaching tribute to the life and times of the great composer who did so much to popularize the jazz and blues idioms. Hancock probes the essence of Gershwin’s muse in exciting new contexts.